We present a method to control the interfacial energy of a liquid metal in an electrolyte via electrochemical deposition (or removal) of a surface oxide layer. This simple method can control the capillary behavior of gallium-based liquid metals by tuning the interfacial energy rapidly, significantly, and reversibly using modest voltages. Eaker, C. B., Khan, M. R., Dickey, M. D. A Method to Manipulate Surface Tension of a Liquid Metal via Surface Oxidation and Reduction. J. Vis. Exp. (107), e53567, doi:10.3791/53567 (2016). Controlling interfacial tension is an effective method for manipulating the shape, position, and flow of fluids at sub-millimeter length scales, where interfacial tension is a dominant force. A variety of methods exist for controlling the interfacial tension of aqueous and organic liquids on this scale; however, these techniques have limited utility for liquid metals due to their large interfacial tension. Liquid metals can form soft, stretchable, and shape-reconfigurable components in electronic and electromagnetic devices. Although it is possible to manipulate these fluids via mechanical methods (e.g., pumping), electrical methods are easier to miniaturize, control, and implement. However, most electrical techniques have their own constraints: electrowetting-on-dielectric requires large (kV) potentials for modest actuation, electrocapillarity can affect relatively small changes in the interfacial tension, and continuous electrowetting is limited to plugs of the liquid metal in capillaries. 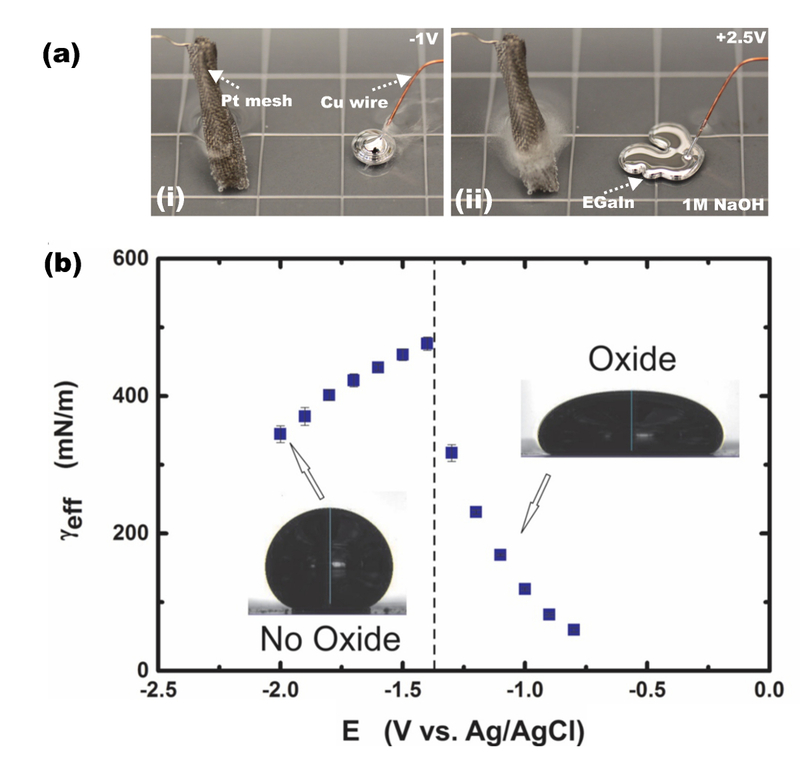 Here, we present a method for actuating gallium and gallium-based liquid metal alloys via an electrochemical surface reaction. Controlling the electrochemical potential on the surface of the liquid metal in electrolyte rapidly and reversibly changes the interfacial tension by over two orders of magnitude ( ̴500 mN/m to near zero). Furthermore, this method requires only a very modest potential (< 1 V) applied relative to a counter electrode. The resulting change in tension is due primarily to the electrochemical deposition of a surface oxide layer, which acts as a surfactant; removal of the oxide increases the interfacial tension, and vice versa. This technique can be applied in a wide variety of electrolytes and is independent of the substrate on which it rests. This method provides a simple way to control the surface tension of liquid metals containing gallium. The method uses modest voltages (~1 V) applied directly to the liquid metal (relative to a counter electrode in the presence of electrolyte) to achieve enormous and reversible changes to the surface tension of the metal1. Surface tension is a dominant force for liquids at small length scales and is important for a number of capillary phenomena including wetting, spreading, and surface-tension driven flow. Consequently, the ability to control surface tension is a sensible way to manipulate the shape, position, and flow of liquids at sub-mm length scales. The most common way to alter surface tension between two fluids is to use a surfactant, which is a molecule that spans the interface between the fluids. Surfactants lower surface tension, but in a way that is not easy to reverse since it is difficult to remove surfactants from the interface. Surface tension can also be altered using a variety of techniques, including temperature gradients2,3, light4, surface chemistry5-7,and voltage8. But most of these methods result in modest changes to surface tension, particularly for liquid metals, which have notably large surface tensions. The ability to control the surface tension of liquid metal could enable new opportunities for creating shape reconfigurable structures with metallic properties for electronic, thermal, and optical applications9-14. The most common liquid metal is Hg, which is noted for its toxicity. The methods described here are relevant for liquid metals based on gallium. These metals have low viscosity, large surface tension, low volatility (low vapor pressure), and low toxicity15. Importantly, these metals form surface oxides composed of gallium oxide that are a few nm thick in air16. This oxide layer creates a physical skin that historically has been a nuisance for electrochemical and fluid dynamic applications17. The method here utilizes the oxide in new ways to control surface tension. The most common way to manipulate liquid metals in electrolyte is to apply a potential to the metal relative to a counter electrode18. Oppositely charged ions from the electrolyte match the charges on the metal, causing the interfacial tension to drop. This phenomenon-termed electrocapillarity-has been known since the 1870s as described by Lippman19and has been utilized for alloys of gallium20. Typically, electrocapillarity achieves modest changes to surface tension, since undesirable electrochemical reactions limit the range of voltages applied to the metal. In contrast, the method described here utilizes the surface oxidation of the metal (or conversely, the reduction of the surface oxide) as a way to achieve enormous changes in surface tension above and beyond changes resulting from electrocapillarity. The leading explanation for this phenomenon is that the oxide is asymmetric; that is, the outer surface of the oxide terminates with hydroxyl groups (making a low interfacial tension interface with the aqueous electrolyte), and the interior surface of the oxide terminates with gallium atoms (making a low interfacial tension interface with the metal). In contrast, the removal of the oxide via electrochemical reduction results in a bare metal-electrolyte interface, which returns the metal back to a state of high surface tension. We characterize the interfacial tension of the metal by analyzing the shape of sessile droplets as a function of voltage while assuming that gravity and surface tension are the dominant forces that define the curvature of its surface. The advantage of this technique relative to classic electrocapillarity is that it can reversibly tune the tension of low toxicity liquid metals over enormous ranges (from ~500 mN/m to near zero). This delta change in surface tension may be the largest ever reported in literature for any fluid and it can be accomplished in a tunable and reversible manner. These large changes in surface tension are useful for manipulating the capillary behavior of metals; for example, it can induce the metal to spread on a surface, withdraw the metal from microchannels, fill microchannels with metal, and overcome the Rayleigh instabilities to form liquid metal fibers1,21. A drawback of this technique is that it requires electrolyte. It works best in acidic or basic conditions, because these electrolytes remove excess surface oxide that would otherwise contaminate the surface of the metal and mechanically restrict the movement of the metal. The simultaneous removal and deposition of the oxide layer complicates the analysis of the interfacial phenomena and it is our hope the methods described in this paper empowers additional analysis. Another disadvantage is that the electrochemical reactions at the surface of the metal must be matched by complimentary half-reactions at the counter electrode22,23. This can lead to hydrogen bubbles forming at the counter electrode. Pour an aqueous electrolyte (acidic or basic) into a Petri dish. To ensure that the oxide is completely removed, use an acid or base with a concentration greater than 0.1 M24 (e.g. 1 M NaOH or 1 M HCl). Use a volume that will fill the dish to a depth of approximately 1-3 mm. Avoid contacting the skin with these solutions. Use a syringe to place a drop (optimally between 10-500 µl) of a gallium-based alloy in the electrolyte. Examples include eutectic gallium indium (EGaIn) or gallium indium tin (Galinstan). If pure gallium is used, warm the electrolyte to at least 30 °C to prevent freezing. Place a copper wire into the liquid metal to establish the working electrode. Use a copper wire with a diameter less than that of the drop, and use a digital multimeter according to manufacturer's instructions to ensure that the wire has a resistance of < 1 Ω. In acid or base, the liquid metal will wet the copper and thereby form an excellent electrical contact. Place a conducting counter-electrode (e.g. copper, graphite, platinum, etc.) in the solution, but not in contact with the liquid metal. If the counter-electrode has a resistance of < 1 Ω, its dimensions are irrelevant. Connect the wires to a voltage source and apply a positive potential to the liquid metal. For small shape deformation, apply positive voltages < 1 V. For larger shape deformation (and movement of the liquid metal toward the counter-electrode), apply > 1 V.
Note: The concentration of the solution and the distance of the drop from the counter-electrode dictate the voltage necessary to induce changes in interfacial tension since the rate of electrochemical surface oxidation competes with the rate of oxide dissolution by the electrolyte. Dispense a drop (10-500 μl) of the liquid metal from a syringe into an empty Petri dish. Pour a neutral aqueous electrolyte into the Petri dish (e.g. 1 M sodium fluoride (NaF) or 1 M sodium chloride (NaCl)) to a level that submerges the metal. Note: Use of an acidic (pH < 3) or basic solution (pH > 10) will cause the oxide to dissolve spontaneously. Place a copper wire into the liquid metal to act as a working electrode, and a conducting wire (e.g., copper) into the electrolyte to act as the counter-electrode. Connect the wires to a voltage source and apply a negative potential to the liquid metal. Apply approximately -1 V to remove the surface oxide and cause the metal to dewet from the substrate. The metal should dewet on the side closest to the counter-electrode. Apply more negative potentials (<-1 V) to remove the oxide layer completely. Avoid applying excessively large negative voltages to prevent hydrogen bubbles from appearing on the liquid metal due to reduction of the electrolyte. Using a laser cutter or milling tool, cut a direct path from the center to the edge of a piece of polymethylmethacrylate (PMMA) (~1 mm thick). Do not cut the path all the way through the thickness of the PMMA; only cut about halfway through. This piece will serve as a substrate for the liquid metal. Other flat and electrically insulating materials such as glass, ceramics, or polymers can also serve as the substrate. With the same tool, cut a 1 mm2 hole through the center of the PMMA. Using the path as a guide, run an insulated copper wire with only the tip exposed to the center of the PMMA. Position the wire so that it is protruding over the PMMA surface. Seal the wire in place with a leakproof adhesive. Cut the wire just above the surface of the PMMA, but do not let it extend too far (beyond ~100 μm) or it will disturb the shape of the drop. Tape the PMMA piece down into a transparent container through which a clear image can be obtained. Fill the container with 1 M NaOH, and place a 25-50 µl drop of liquid metal on the protruding copper wire. This wire will serve as the working electrode and will wet the droplet. Place a platinum mesh counter-electrode and a saturated silver/silver chloride (Ag/AgCl) reference electrode in the solution. Connect all of the electrodes to a potentiostat. Place the container in a contact angle goniometer so that the surface profile of the drop is clearly visible. Use the potentiostat to control the voltage with respect to the reference electrode, and use the goniometer to measure the shape and thereby the interfacial tension of the drop. Ensure that the goniometer is capable of measuring sessile drop interfacial tension; it is also possible to use custom axisymmetric shape analysis of drop images taken from a horizontally mounted camera 25. Fill a glass capillary with a solution of 1 M NaOH. The capillary diameter should be ~1 mm. Place one end of the capillary flush against a drop of liquid metal. Align the capillary so that it is parallel with the surface of the table (i.e., perpendicular to gravity). Avoid air gaps between the liquid metal drop and electrolyte-filled capillary. Using a wipe, dab off any excess electrolyte that may have leaked during assembly. Place a copper wire (working electrode) in the liquid metal, and a conductive counter-electrode (e.g. copper wire) in the open end of the capillary so that it contacts the solution. Connect the wires to a voltage source and apply a positive potential to the liquid metal. The liquid metal should begin filling the capillary (avoid large potentials that will cause excess bubble formation on the counter-electrode). Utilize soft lithographic26 and replica molding techniques to fabricate microfluidic channels composed of polydimethylsiloxane (PDMS). Fabricate channels that are approximately 100 to 1,000 µm wide, 100 µm tall, and 25 to 65 mm long. Note: Channel dimensions 1,000 µm wide, 100 µm tall, and 65 mm long channel produced consistent results, but others may also work. Alternatively, use glass capillaries (e.g., 1 mm diameter, borosilicate glass) instead of PDMS microchannels. Inject liquid metal either manually or using a syringe pump to fill the channel completely (i.e., 6.5 mm3 for a 1,000 µm wide, 100 µm tall, and 65 mm long channel). Using a cotton swab that has been dipped in 1 M NaOH or 1 M HCl, remove excess amounts of liquid metal from the inlet (and, if necessary, the outlet) of the channel, so that the metal remains flush with the top surface of the PDMS. Submerge one end of the channel in electrolyte (e.g., 1 M NaCl), and place the anode (e.g., wires of copper, platinum, or tungsten) such that it touches the electrolyte but not the metal. At the other end of the channel, contact a separate electrode (e.g., Cu wire) to the metal surface so that liquid metal itself acts as a cathode. Connect these wires (i.e., anode and cathode) to a voltage source or potentiostat, and complete the electric circuit. For a three electrode system, place the reference electrode such that it barely submerges into the drop of electrolyte. Before applying a reducing voltage, mount a video camera on a tripod or in a microscope to record the experiments. Use autofocus mode to get everything in focus. Utilize manual focus to have a better control over depth of field, white balance, and ISO. As necessary, use higher F stop (i.e., 11 or higher), 1/100th shutter, auto white balance and auto ISO. Start recording the experiment. Apply approximately -1 V to withdraw the liquid metal from the microchannels. Turn the voltage off to cause the metal to stop moving in neutral electrolyte. Figure 1A shows an example of the simple two-electrode technique for oxidation and reduction. In this instance, a 70 µl drop of the liquid metal placed in a 1 M NaOH solution contacts a copper wire to establish an electrical connection. The 1 M NaOH removes the surface oxide from the metal and allows the metal to bead up due to its interfacial tension. Applying a 2.5 V potential between the drop and a platinum mesh counter-electrode causes the surface of the drop to oxidize and the drop spreads while migrating toward the counter-electrode (Figure 1Aii). Applying a -1 V potential to the liquid metal removes the oxide (in addition to the removal of the oxide by NaOH), causes the metal to bead up, and generates hydrogen bubbles on the drop due to the reductive potential (Figure 1Ai). Hydrogen bubbles form on the platinum counter electrode due to the complimentary electrochemical half-reaction that presumably reduces protons in solution. An electrocapillary curve (Figure 1B) shows the dramatic drop in effective surface tension when the oxide layer forms. These data were taken in 1 M NaOH using a saturated Ag/AgCl reference electrode. In this case, the open circuit potential was approximately -1.5 V vs. Ag/AgCl, and the oxide layer formed near -1.3 V vs. Ag/AgCl (indicated by the dotted lines). The use of 1 M HCl results in similar phenomenological behavior, but the formation of bubbles on the surface of the metal, even at oxidative potentials, makes visual analysis difficult. In the absence of the oxide (which is removed by 1 M NaOH, for example), bare liquid metal is a high surface tension fluid and adopts a spherical shape as shown in Figure 2A. A drop of liquid metal rests adjacent to a capillary tube filled with 1 M NaOH. A wipe removes excess electrolyte from the bottom of the droplet, as shown by Figure 2B. A copper wire touches the droplet to form the anode and the other electrode (i.e., cathode; not shown in Figure 2) rests inside the electrolyte filled capillary tube. The electrolyte in the capillary completes the circuit between the two electrodes, as shown in Figure 2C. Applying +1 V lowers the surface tension at the leading interface and causes the liquid metal to fill the capillary as shown in Figure 2D. This experiment works best if the metal is flush with the end of the tube. In contrast, a reducing bias removes the oxide skin and returns the metal to a state of large surface tension. One such example is shown in Figure 3A. The oxide skin stabilizes the shape of a puddle of liquid metal submerged in neutral electrolyte (Figure 3Ai). Application of a reducing bias removes the oxide skin, allowing the metal to bead up as shown in Figure 3A(ii-iii). We call this technique "recapillarity" since it uses reductive potentials to induce capillary behaviors21. The other implication of this term is that capillary behavior can be turned on or off multiple times. For example, EGaIn can be withdrawn from PDMS microfluidic channels by reducing the oxide that otherwise stabilizes the metal in the channels (as described in 4.1). Figure 3B-D illustrates one such experimental sequence. We insert a syringe needle at one end of the capillary and slowly push the syringe plunger to force the metal from the syringe into the capillary. We place the filled capillary on a custom holder composed of polymethylmethacrylate (PMMA). The holder has two reservoirs, two grooves to secure the capillary, two holes to insert wires, and also has the option to tape a ruler, as shown in Figure 3B. Electrolyte (e.g. aqueous sodium fluoride) added to the reservoir after injecting the metal connects the anode to the end of the capillary, as shown in Figure 3C. The metal inside the tube contacts the counter electrode on the other end of the capillary to complete the circuit. Applying 1V reducing bias causes the metal to withdraw and move away from the anode, as shown in Figure 3D. Later, we measure the withdrawal velocity by comparing the position of the metal with respect to time. One such velocity plot is shown in Figure 3E. The velocity decays as the metal moves away from the anode. This velocity decay is due to the increase in electrical resistance between the anode and the liquid metal21. Figure 1. (A) A drop of EGaIn submerged in 1 M NaOH, with a copper wire attached to the drop and a platinum counter-electrode mesh in solution. i) A -1 V potential applied to the drop causes the metal to bead up and produces hydrogen on the surface of the metal. ii) A 2.5 V potential applied to the drop induces spreading. (B) An electrocapillary curve of an EGaIn drop in 1 M NaOH. The reductive side (voltages below -1.4 V vs. Ag/AgCl) shows traditional electrocapillarity behavior, while the oxidative side shows a significant drop in surface tension. Figure 1B adopted from Reference 1 (Copyright 2014, National Academy of Sciences, USA). Please click here to view a larger version of this figure. Figure 2. Capillary injection of liquid metal using oxidative bias. (A) A drop of liquid metal contacts the opening to a capillary tube filled with electrolyte. (B) The tube is aligned and pushed against the drop. A wipe removes the excess amount of electrolyte. (C) A labeled image of this experimental set-up. (D) Application of +1 V to the metal lowers the surface tension of the metal via surface oxidation, and induces flow. Please click here to view a larger version of this figure. Figure 3. (A) A drop of the liquid metal in 1 M NaF solution. i) The oxide allows a stable, non-spherical puddle in the solution. ii-iii) Applying a -1 V potential causes the metal to bead up. (B) A custom made acrylic substrate has two reservoirs into which electrodes are inserted. A 70 mm long, 1 mm ID glass capillary filled with EGaIn spans the two reservoirs. The substrate has two grooves to fit this capillary firmly. (C) A drop of electrolyte is added to one reservoir, and the other reservoir is left as is. Sometimes bubbles form, which can be minimized by using a fine tip needle. (D) Application of a reducing bias removes the oxide and causes the metal to withdraw. (E) Withdrawal velocity of the liquid metal from the capillary as a function of time. Please click here to view a larger version of this figure. This method controls the surface tension of gallium-based liquid metals using small voltages to drive the deposition and removal of a surface oxide. Although the method only works in electrolyte solutions, it is simple, and works in a wide variety of different conditions, but there are subtleties worth noting. In the absence of electrical potential, both acidic and basic solutions etch away the oxide27. The application of an oxidative potential drives the formation of surface oxide in all aqueous electrolytes, including acidic and basic solutions. However, dissolution of the oxide in acidic or basic solutions competes with the deposition of the oxide to prevent excessive build-up of the oxide layer. The formation of a thick oxide layer inhibits flow, presumably since the oxide provides a mechanical barrier to movement. This inhibition can be detrimental during spreading, but also provides a method to stabilize the shape of the metal. The interfacial tension varies continuously as a function of potential. The surface tension is largest at the potential that removes the surface oxide. Potentials that are more reductive (more negative) will slightly decrease the surface tension due to classic electrocapillarity (cf., Figure 1B). This decrease continues as a function of potential until Faradaic processes (e.g. hydrogen formation) occur at the surface. In contrast, the surface tension drops significantly at the potential where the oxide first forms (cf. Figure 1B). Increasing the (positive) potential continues to lower the surface tension, presumably due to better coverage of the surface oxide. Beyond a "critical potential", the drop will begin spreading without bound, forming fractal-like patterns and migrating toward the counter-electrode. This movement continues until the voltage is removed, or until the drop breaks contact with the working electrode. The shapes formed in the region above the critical potential are still being investigated but are attributed to the surface tension being near zero. Details can be found in the literature1. The interfacial tension of the metal is sensitive to small changes in voltage. It is therefore important to have excellent electrical contact with the metal and control over the potential applied to the liquid metal. In addition, the presence of acid or base in the electrolyte competes with electrochemical oxidation by dissolving the oxide layer. This competing process adds a level of complexity; understanding the complex process that occur at the interface will be critical for advancing this method. Oxidative and reductive processes can be combined to provide control over the flow of metal in and out of capillaries. For example, it is possible to use oxidative potentials to inject metal into capillaries (by lowering the interfacial tension of the leading meniscus, as shown in Figure 2), and then use reductive potentials to induce the metal to retreat from the capillary (by increasing the interfacial tension of the leading meniscus, as shown in Figure 3)28,29. The limits and capabilities of this approach are yet to be fully determined, although injection appears to be slower than withdrawal. Using oxidation to inject metal involves three critical steps. First, the capillary should be prefilled with electrolyte, which we believe creates a thin "slip layer" of water between the metal and the walls of the capillary as the metal. Second, injecting the metal into a capillary requires flush contact between a bead of the metal and the end of the capillary, as shown in Figure 3. This intimate contact ensures the potential drop occurs at the electrolyte / metal interface and prevents pathways for charge to bypass this interface. It is possible to use either two-electrode or three-electrode systems to control the surface tension of the metal. The two-electrode system is the simplest, requiring only a working electrode, counter electrode, and voltage source. Although the two-electrode system is suitable for demonstrations, the potential of the counter-electrode can drift. Sensitive electrochemical measurements benefit from the stability of three-electrode system (i.e., a reference electrode and a potentiostat). This system allows for better control of the voltage, and provides an accurate reading of the current. The ability to control interfacial tension using modest voltages is a promising method for controlling the shape, flow, and position of metallic structures at the sub-mm length scale. We believe this technique may be useful for creating metallic structures that change shape on demand, which may find applications in shape reconfigurable electronics, tunable antennas, switches, microfluidic components, optofluidics, and shape-shifting meta-materials. The authors acknowledge support from Samsung, the NC State Chancellors Innovation Funds, NSF (CAREER CMMI-0954321 and Triangle MRSEC DMR-1121107), and Air Force Research Labs. Khan, M. R., Eaker, C. B., Bowden, E. F., Dickey, M. D. Giant and switchable surface activity of liquid metal via surface oxidation. Proc. Natl. Acad. Sci. 111, (39), 14047-14051 (2014). Kataoka, D. E., Troian, S. M. Patterning liquid flow on the microscopic scale. Nature. 402, (6763), 794-797 (1999). Daniel, S., Chaudhury, M. K., Chen, J. C. Fast Drop Movements Resulting from the Phase Change on a Gradient Surface. Science. 291, (5504), 633-636 (2001). Ichimura, K., Oh, S. K., Nakagawa, M. Light-driven motion of liquids on a photoresponsive surface. Science. 288, (5471), 1624-1626 (2000). Gallardo, B. S., et al. Electrochemical principles for active control of liquids on submillimeter scales. Science. 283, (5398), 57-60 (1999). Zhao, B., Moore, J. S., Beebe, D. J. Surface-Directed Liquid Flow Inside Microchannels. Science. 291, (5506), 1023-1026 (2001). Chaudhury, M. K., Whitesides, G. M. How to Make Water Run Uphill. Science. 256, (5063), 1539-1541 (1992). Lahann, J., et al. A reversibly switching surface. Science. 299, (5605), 371-374 (2003). Rogers, J. A., Someya, T., Huang, Y. Materials and Mechanics for Stretchable Electronics. Science. 327, (5973), 1603-1607 (2010). Bauer, S., et al. 25th Anniversary Article: A Soft Future: From Robots and Sensor Skin to Energy Harvesters. Adv. Mater. 26, (1), 149-162 (2013). Ozbay, E. Plasmonics: Merging Photonics and Electronics at Nanoscale Dimensions. Science. 311, (5758), 189-193 (2006). Monat, C., Domachuk, P., Eggleton, B. J. Integrated optofluidics: A new river of light. Nat. Photonics. 1, (2), 106-114 (2007). Schurig, D., et al. Metamaterial Electromagnetic Cloak at Microwave Frequencies. Science. 314, (5801), 977-980 (2006). Dickey, M. D. Emerging Applications of Liquid Metals Featuring Surface Oxides. ACS Appl. Mater. Interfaces. 6, (21), 18369-18379 (2014). Dickey, M. D., et al. Eutectic gallium-indium (EGaIn): A liquid metal alloy for the formation of stable structures in microchannels at room temperature. Adv. Funct. Mater. 18, (7), 1097-1104 (2008). Regan, M. J., et al. X-ray study of the oxidation of liquid-gallium surfaces. Phys. Rev. B. 55, (16), 10786-10790 (1997). Giguère, P. A., Lamontagne, D. Polarography with a Dropping Gallium Electrode. Science. 120, (3114), 390-391 (1954). Frumkin, A., Polianovskaya, N., Grigoryev, N., Bagotskaya, I. Electrocapillary phenomena on gallium. Electrochim. Acta. 10, (8), 793-802 (1965). Lippmann, G. France Université. Relations entre les phénomènes électriques et capillaires. Gauthier-Villars. (1875). Tsai, J. T. H., Ho, C. M., Wang, F. C., Liang, C. T. Ultrahigh contrast light valve driven by electrocapillarity of liquid gallium. Appl. Phys. Lett. 95, (25), 251110 (2009). 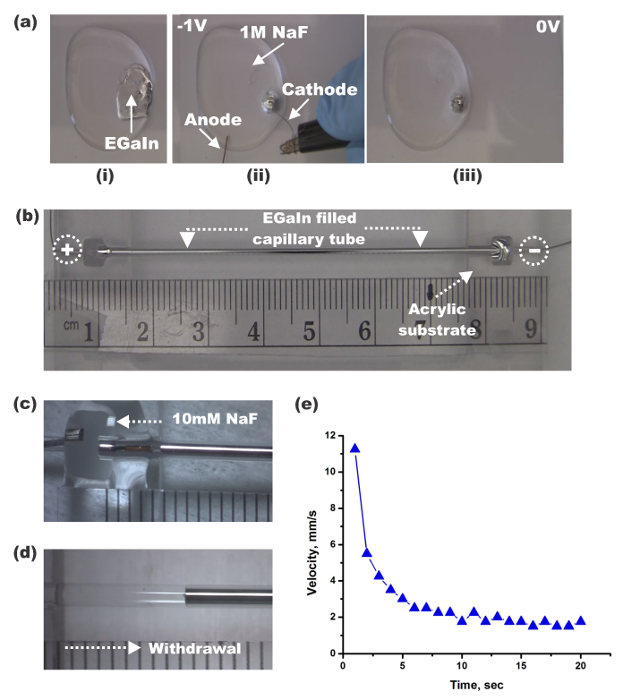 Khan, M. R., Trlica, C., Dickey, M. D. Recapillarity: Electrochemically Controlled Capillary Withdrawal of a Liquid Metal Alloy from Microchannels. Adv. Funct. Mater. 25, (5), 671-678 (2015). Saltman, W., Nachtrieb, N. The Electrochemistry of Gallium. J. Electrochem. Soc. 100, 126-130 (1953). Perkins, R. Anodic-Oxidation of Gallium in Alkaline-Solution. J. Electroanal. Chem. 101, 47-57 (1979). Xu, Q., Oudalov, N., Guo, Q., Jaeger, H. M., Brown, E. Effect of oxidation on the mechanical properties of liquid gallium and eutectic gallium-indium. Phys. Fluids. 24, 063101 (2012). Rotenberg, Y., Boruvka, L., Neumann, A. W. Determination of surface tension and contact angle from the shapes of axisymmetric fluid interfaces. J. Colloid Interface Sci. 93, 169-183 (1983). Xia, Y., Whitesides, G. M. Soft Lithography. Annu. Rev. Mater. Sci. 28, (1), 153-184 (1998). Pourbaix, M. Atlas of Electrochemical Equilibria in Aqueous Solutions. Natl Assn of Corrosion. (1974). Gough, R. C., et al. Rapid electrocapillary deformation of liquid metal with reversible shape retention. Micro Nano Syst. Lett. 3, (1), 1-9 (2015). Wang, M., Trlica, C., Khan, M. R., Dickey, M. D., Adams, J. J. 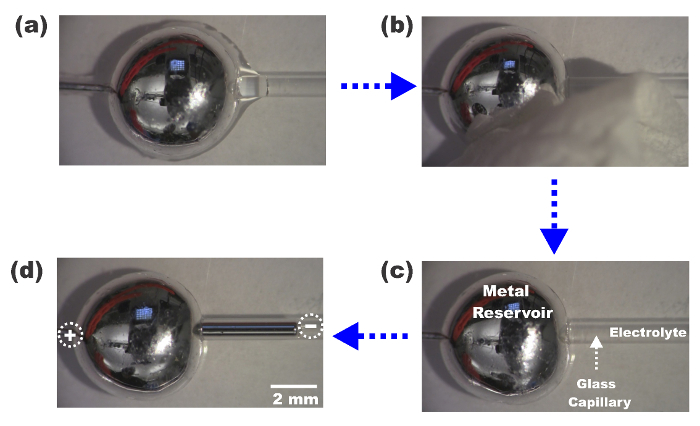 A reconfigurable liquid metal antenna driven by electrochemically controlled capillarity. J. Appl. Phys. 117, (19), 194901 (2015).